The Toronto Profile bulletin “Housing Occupancy Trends, 1996-2011” analyzes patterns in housing supply and demand over a fifteen year period. It examines changing household characteristics and development trends and the impact they have on housing across Toronto. 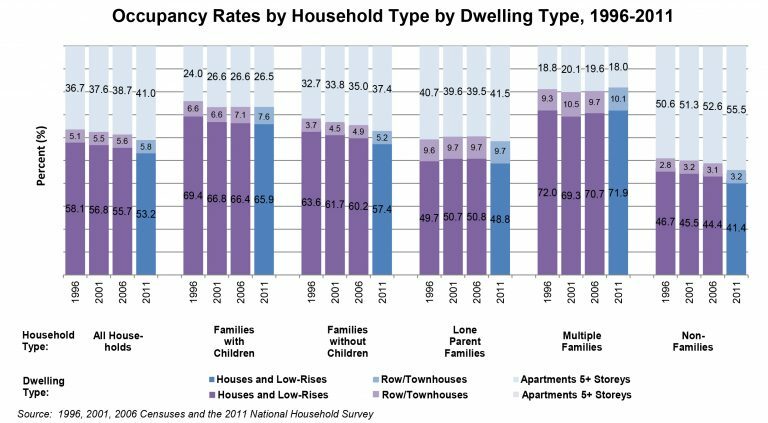 To gain a better understanding of what types of housing will be needed in the future, the bulletin observes past housing demand patterns using the 1996, 2001 and 2006 Census and the 2011 National Household Survey. It examines the characteristics of households occupying the existing housing stock to determine potential challenges facing future housing demand and supply. What are the ages of the households? How does family composition affect housing? Has there been a shift in the demand for certain types of housing by households of a certain age and type? What does the rental and ownership landscape look like?